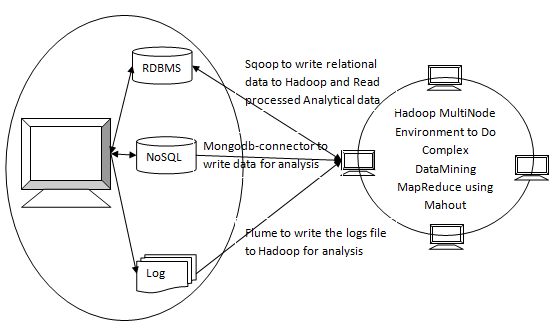 This blog talks about a typical solution architecture where we use various BigData components like Hadoop, Mahout, Sqoop, Flume and Mongo-Hadoop Connector. Lot of successful companies have been around for atleast 20yrs and have invested in IT infrastructure. They have over a period of time, accumulated data in the form of transaction data, log archive and are eager to analyse these data and see if they can improve the business efficiency out of it. Below is the Component Diagram of how each of the above frameworks fit into the ecosystem. In a typical scenario, as the customer are using the IT systems of the company for buying companies products the customer data like , their purchasing patterns, their location, their Gender, how are other similar customers are purchasing are being stored for data mining. Based on this data, the company can helping customers make buying decisions. If you notice carefully Netflix, Amazon, eBay, Gilt are already doing this. Once the data is in HDFS, we can use Mahout Batch job to run the data analysis and import the processed data back to transactional database. This entry was posted in BigData and tagged Hadoop on June 24, 2012 by Krishna. Thanks for your valuable Information, i had same problem last few months, i dont know where i apply Hadoop and its subprojects… Now i got some idea..